We didn’t walk, we ran to the Metropolitan Museum’s Impressionism, Fashion & Modernity exhibit in New York City recently. 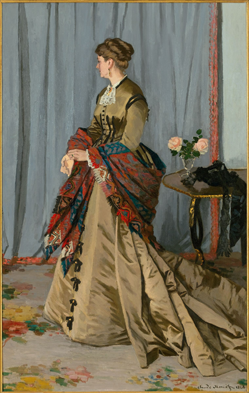 Where would you ever find over 80 major figure paintings by the likes of Manet, Monet, Degas, Cassatt and others on display with the fashion of the day? We thought it would be a one of a kind experience, and the show did not disappoint. 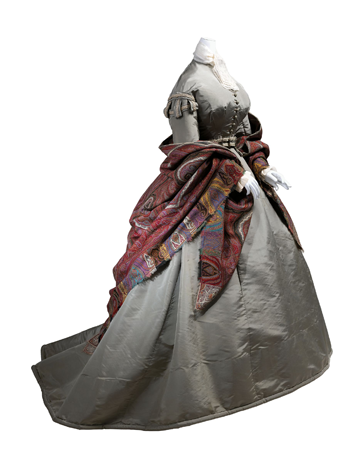 The galleries were organized to feature different categories of costumes, beginning with the British, French and American Day Dresses of the 1860s. The fabrics were what caught the Eye, everything from crinolines to cotton piqué to piqué with soutache. Soutache was a new word to us but we found out it simply meant flat, narrow braiding inspired by military uniforms. 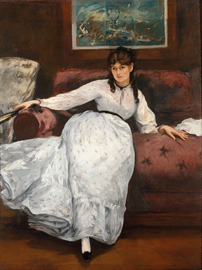 A room with exquisite White Dresses the likes of which could be seen in the paintings of Edouard Manet, James Tissot and Berthe Morisot followed. The fabrics again stole the show, including a dress in bleached linen with matching sash and a seaside ensemble in cotton with machine embroidery. 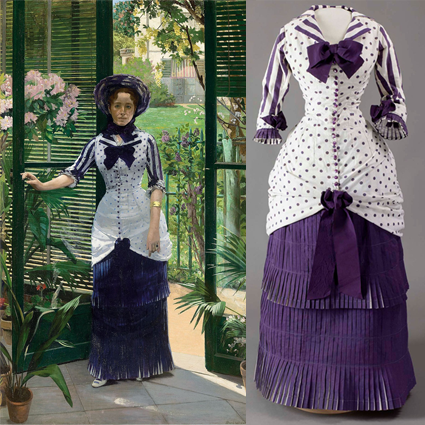 Our favorite costume was the actual summer dress worn by Madame Bartholomé in the famous Albert Bartholomé painting In the Conservatory, 1880. This white cotton frock with its purple dots, stripes and precise pleating was a showstopper. This treasure of a dress was preserved by Bartholomé in memory of his wife. We were drawn also to the beautiful accessories of the day in rooms with straw-trimmed bonnets of the 1880s and French fans with lithographed prints. Dainty pink shoes in their original form with accompanying etchings were a statement in femininity. There was much more to see including the exquisite modern “urban” wear and evening dresses, but it was difficult to take it all in during one visit. Unfortunately, the show is ending its New York run May 27, but will continue on to Chicago, opening June 26 at the Art Institute. If you love fashion and long to see exquisite designs of centuries past, this show is a must. Just to see these special paintings is a treat in itself. If you can’t visit the exhibit, you can view it all in a beautiful book, Impressionism, Fashion & Modernity. 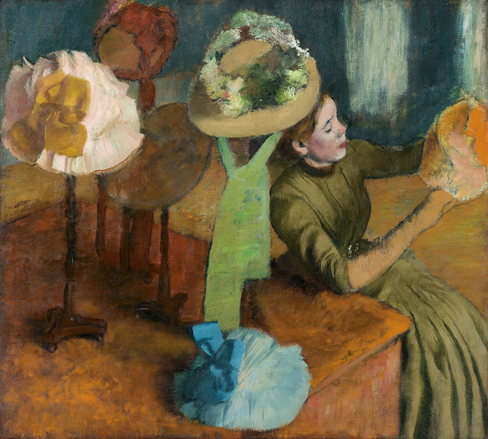 Because we feature so many stylish hats on this website, we wanted to include a favorite painting on display, Edgar Degas’ The Millinery Shop, 1879. He was known as a close observer of women’s fashion. You can see the subject of his special interest below. The incurable romantics among us need not lose hope. I’ve found the Holy Grail of love letters. I wasn’t looking for it, but there’s a lot of interest in the famous photographer Alfred Stieglitz here in New York. His personal collection of paintings from artists ranging from Henri Matisse to Georgia O’Keeffe closed its showing at the Metropolitan Museum of Art recently. This exhibit brought renewed attention to a book about Stieglitz and O’Keeffe (his wife) that came out last summer. What seemed to fuel this passionate union of two extraordinary people were words. A massive collection of their letters is entitled My Far Away One (Yale Press, 2011). The relationship between one of American art’s most famous couple began as a friendship, a professional connection which grew into a love affair and culminated in their marriage. What seemed to fuel this passionate union of two extraordinary people were words. Those words produced over 25,000 pages of letters. My Far Away One is a compilation of 650 of those letters, carefully chosen and annotated by leading photography scholar Sarah Greenough. She is the photography curator of the National Gallery in Washington and was a friend of O’Keeffe’s. 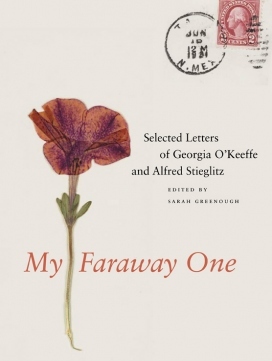 This is the first volume of her work which includes the Stieglitz–O’Keeffe letters from 1915 to 1933. The second volume is expected to include letters from 1934 until Stieglitz’s death in 1946. In this era of texting and instant messaging, it is hard to imagine that any couple could write so many letters. But theirs was a vastly different age. Even long distance telephone calls were not an option. The couple wrote incessantly to each other, almost every day and sometimes two or three times a day. Through these letters, Stieglitz and O’Keeffe reported on the various details of their daily lives, communicated their thoughts about art, and ended up defining themselves in relation to each other. When they first began corresponding in 1915, Stieglitz was a 52-year-old married man at the height of his fame. He was an internationally acclaimed photographer who is widely credited with making photography accepted as a true art form in America. This YouTube video will give you a glimpse into the genius of Stieglitz. He dominated the New York art scene through a succession of galleries in which he showcased various artists’ work. Georgia O’Keeffe was one of those artists. O’Keeffe was 28-years-old and an unknown, struggling painter who taught school in Texas. The two connected when a mutual friend brought O’Keeffe’s work to Stieglitz’s gallery. For Stieglitz, it was love at the first sight of O’Keeffe’s work; he became a life-long promoter. In him, O’Keeffe found a mentor and later a passionate lover who was miserable in his marriage. Stieglitz was to photograph O’Keeffe many times throughout her life, admiringly and strikingly. The first of these photos was a famous image of the artist’s hands. The couple began living together in 1924 when O’Keeffe came to New York. Stieglitz divorced soon after and the two were married. Friends and colleagues said that their passion generated such heat that it literally eclipsed everything but each other in their eyes. But as with many long relationships, the cracks in this one started to show. O’Keeffe was much younger and wanted a baby. Stieglitz did not. O’Keeffe also felt stifled by Stieglitz’s large family whom they lived with and who took much of her time. She was frustrated by the little attention she was able to devote to painting. To get away from spending summers with the Stieglitz family at their home in Lake George, O’Keeffe and a friend traveled to New Mexico. With the help of art patron Mabel Dodge Luhan, she found a studio in Taos and began to paint. This was a decisive moment. In New Mexico, she not only found the freedom to paint but also the inspiration to create. Everything about this part of the country made her happy. She wrote Stieglitz that she longed to live in one of the adobe huts. Nature came alive to her in a way it had never done before. While it was one of the happiest moments of her life, it brought about one of the saddest in Stieglitz’s. He fell apart and felt lost without her. She wrote to him that she hoped her new plan “carries no hurt to you.” But she was sure that “much life in me would die” without the chance to paint in New Mexico. O’Keeffe stayed in New Mexico. 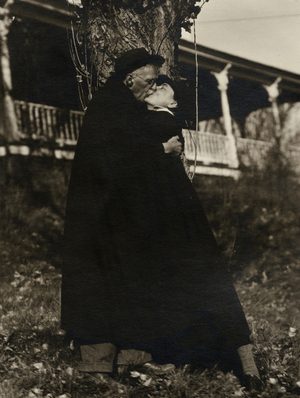 Stieglitz eventually took a mistress. In this YouTube video you’ll see O’Keeffe at 90 talk about her love of the Southwest and painting. But the two stay married, kept writing, and O’Keeffe was at his beside when he died. In many ways, this part of O’Keeffe’s marriage to Stieglitz embodied the conflict in the heart of many modern women artists. On one side there is love and marriage and on the other there is ambition and work. It is a journey of hard choices, hard-won freedom, and sacrifices on both sides. My Faraway One is a tribute to O’Keeffe and the man who helped her become a great artist. O’Keeffe never remarried after Stieglitz’s death. She went on to become more acclaimed and more famous than perhaps any other woman painter of her time. She died in New Mexico at the age of 98. Sarah Greenough’s My Faraway One is a tribute to O’Keeffe and the man who helped her become a great artist. It is also a testament to how real love not only endures, but can inspire us to become our best selves. I think that people today are cynical about enduring romantic love. Who can blame them? Fifty percent of all marriages end in divorce. I’m sure the great romances of today are stories yet to be told. But when a romantic like myself gets hold of a story like Tracy and Hepburn and Stieglitz and O’Keeffe something happens. I want to believe in love. I also want to believe that the love between two people can give rise to something bigger and better than the sum of the two lovers. That’s what happened to these incomparable artists. If you’ve never experienced that kind of love, a merging of two souls, all I can say is that I wish it for you. Happy Valentine’s Day!